Cookies are one of his favorite things to help make. 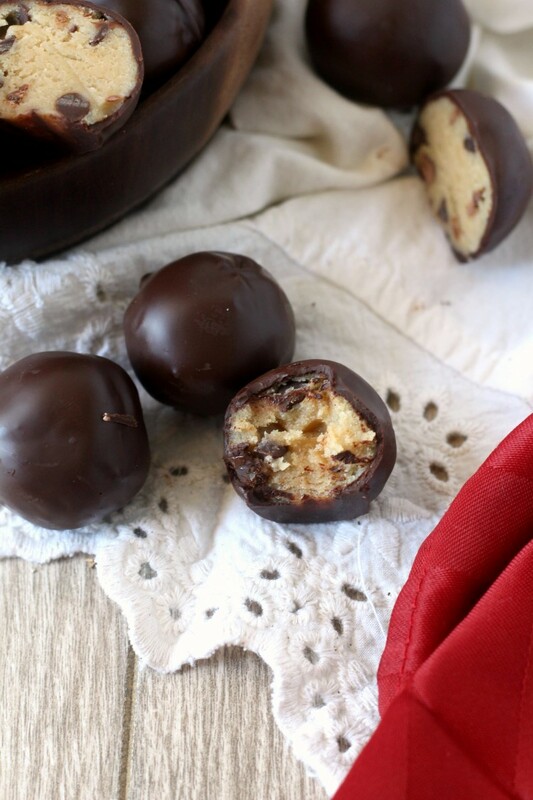 These truffles are also very kid friendly. There is no egg so they can snitch as much dough as you allow 🙂 (Although raw egg has never phased me from snitching bites of cookie dough). 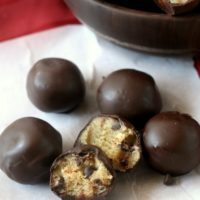 Plus the dough is less sticky than regular cookie dough and so they can help roll the truffles into balls without making such a mess. I recently updated my post for Cookie Dough Brownies. That recipe is one of the oldest on my site so you know I’ve loved cookie dough for a long time. 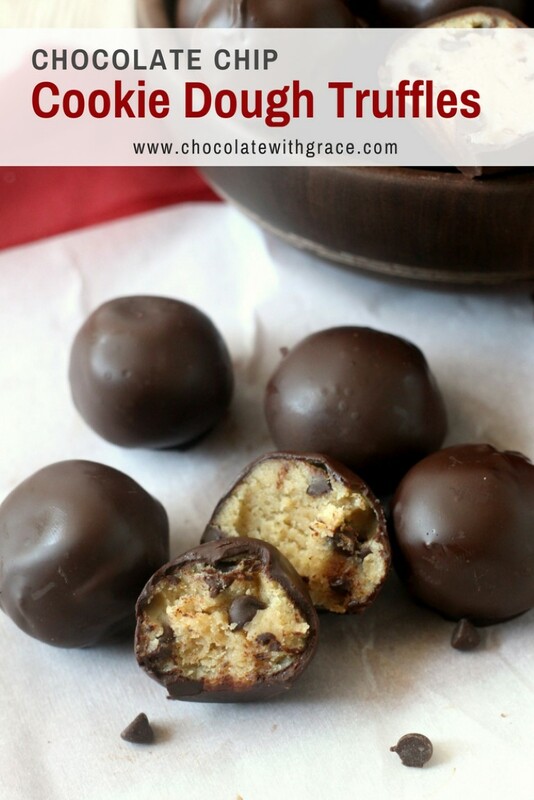 This recipe for the chocolate chip cookie dough truffles is slightly different because it uses sweetened condensed milk which gives them a nice smooth texture. Be sure to include the molasses in the recipe as well. 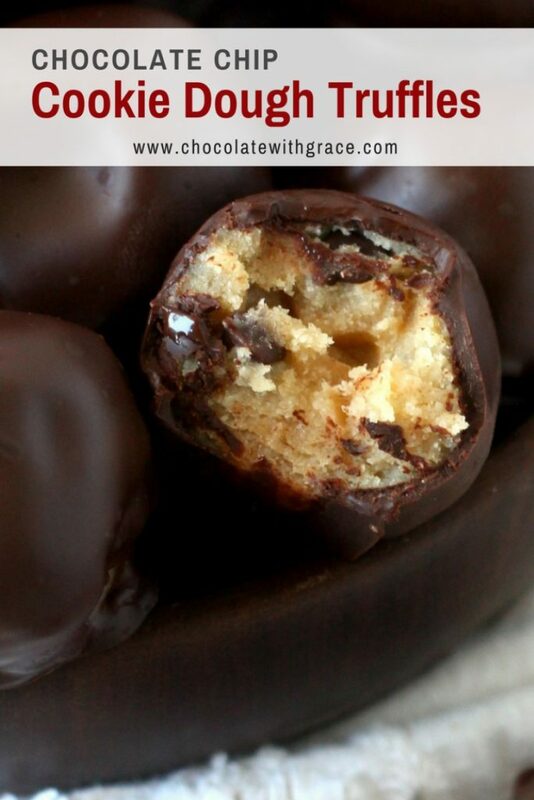 It helps give the truffles the signature cookie dough flavor. If you grease your measuring spoon first, it will help the molasses pour right out without sticking to the spoon. Beat together the butter, brown sugar, molasses and vanilla in a large bowl until creamy. Add the sweetened condensed milk, flour and salt. Stir until well combined and smooth. Stir in mini chocolate chips. Roll the dough into 40 balls, slightly less than an inch in diameter. Set the balls on a parchment lined baking sheet and chill for an hour. Gently melt the chocolate over low heat in a double boiler or in the microwave for 10 second intervals. 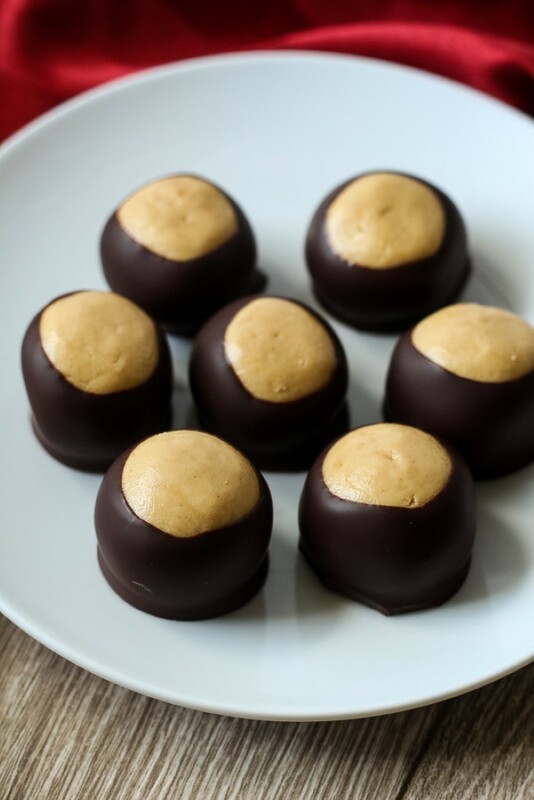 Dip each of the chilled truffles in the chocolate and let cool completely on parchment paper. Store in the fridge. Will last a week in the refrigerator or several weeks in the freezer. 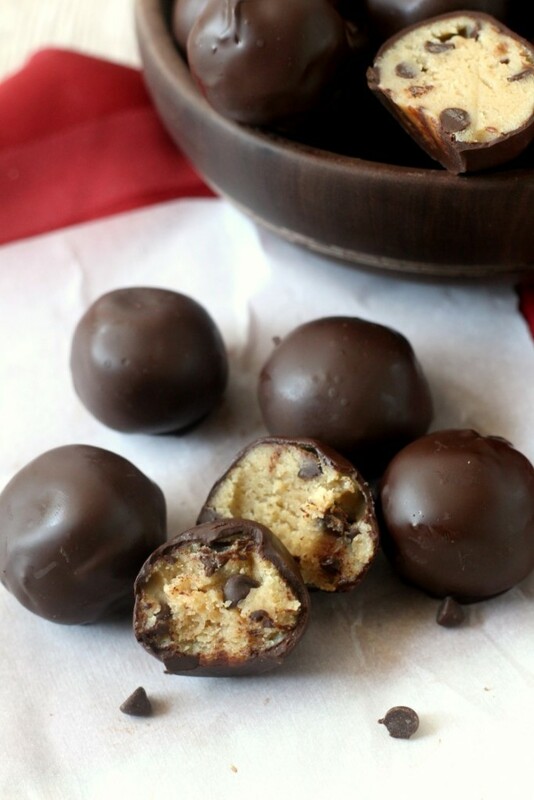 Here are some other cookie dough treats that would be fun to make. Cookie Dough Ice Cream Sandwiches from Mel’s Kitchen Cafe. 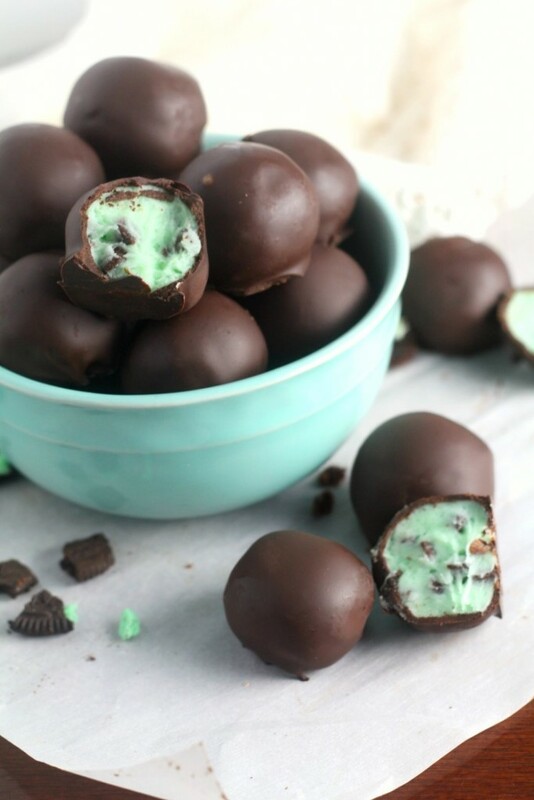 Two of my favorite things in the world in one recipe. Chocolate Chip Cookie Dough Cupcakes from Cupcake Diaries. And this Cookie Dough Frosting sounds good enough to spread on anything.